When writing a document using the text editor on Google Drive, every few seconds a discrete notification appears on the toolbar: “all changes saved in Drive”. The software confirms that the document contents have been automatically saved on one of Google’s servers. It is not necessary to save the document, the platform does it on its own. This automatic save function is a comfort, as it prevents us from losing data through computer failure or carelessness. However, it also reminds us that everything we do on the internet is stored automatically, whether we like it or not. As Boris Groys points out, the internet is a network where data packets circulate that are constantly tracked, labelled and stored. Everything we do when we use a digital device connected to the internet is registered and stored on a remote server. And increasingly we are using connected devices for many of our daily activities, from the moment we get up in the morning to when we go to bed at night and even whilst we are sleeping. The data that is automatically gathered by the devices that surround us is added to the information we voluntarily provide by publishing contents on social networks, writing lists of things to remember on digital notes, using password managers or deciding to wear an activity tracker. All Changes Saved is a collective exhibition with the Google Drive notification as its title, alluding to the way in which our lives are affected by the automatic save function. We trust our data to large companies and we write our biography in real time, but we are unable to control these files or what others do with them. The artworks of various national and international artists pose questions as to the construction of our personal history through the data we share, the use made of that data and the strategies to recover some sort of intimacy. In the summer of 2012, the social network LinkedIn was attacked by hackers who managed to copy its entire user database. A few months later, part of the complete list of user passwords began to circulate on the internet. Bartholl has copied this list of 4.7 million passwords, arranged in alphabetical order, into eight printed volumes. Visitors can consult these books and find out if their password is among them. This work reveals the vulnerability of our data on the internet, as well as the ease with which information circulates that has been taken from the databases of companies that have been attacked. The volumes created by Aram Bartholl play with the concept of telephone directory and give files that are usually hidden a physical form that is easy to understand. By only including the passwords, these books do not violate the privacy of the users but show them that the combination of letters and numbers they so zealously guard and think no one knows is within everybody’s reach. Artists Clara Boj and Diego Díaz decided to automatically gather, in real time, all the data generated by using their mobile telephones during 2017, coinciding with the last few months of pregnancy and the birth of their second child. 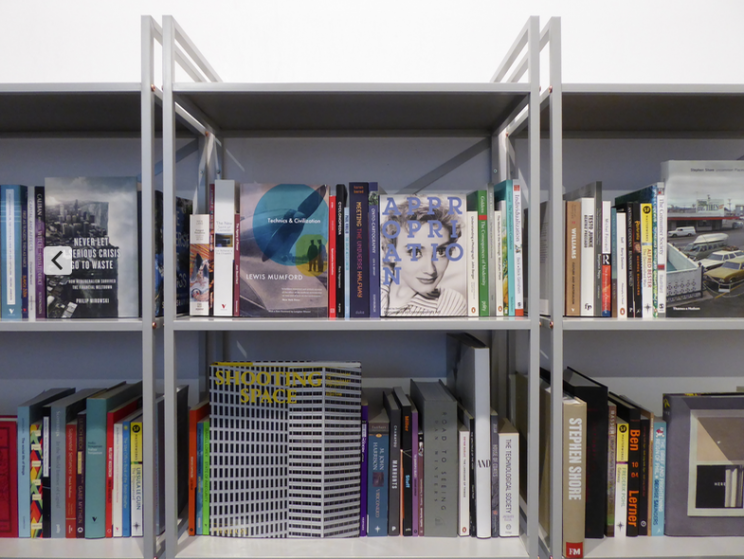 Data Biography is a library of 365 volumes that reflects on paper the artists’ digital footprint over the period of a year. These books contain their emails, text messages, browsing history, location and even photos shared on social networks. The intimate life of this young family is thus exposed in detail. The piece reveals the amount of data gathered daily by the devices we use every day and how these data originate from the user, by sending texts, sharing photos or publishing on social networks, and from the smartphone itself, as it constantly communicates the user’s position and provides other information whilst it is switched on, even though it is not being used. Data Biography addresses the need to write our own biography in real time and the enormous amount of data we provide almost without realising. In this work, Martin John Callanan has gathered together the first 100 books recommended by Amazon, based on everything he has read and bought since the company launched its recommendation algorithm more than 15 years ago. The title refers to how users of any internet service are involuntary transmitters of information, given that the data relative to their actions is registered automatically. It is no longer possible to be a mere receiver of information. There is a constant exchange of data that modifies the actual contents being accessed. 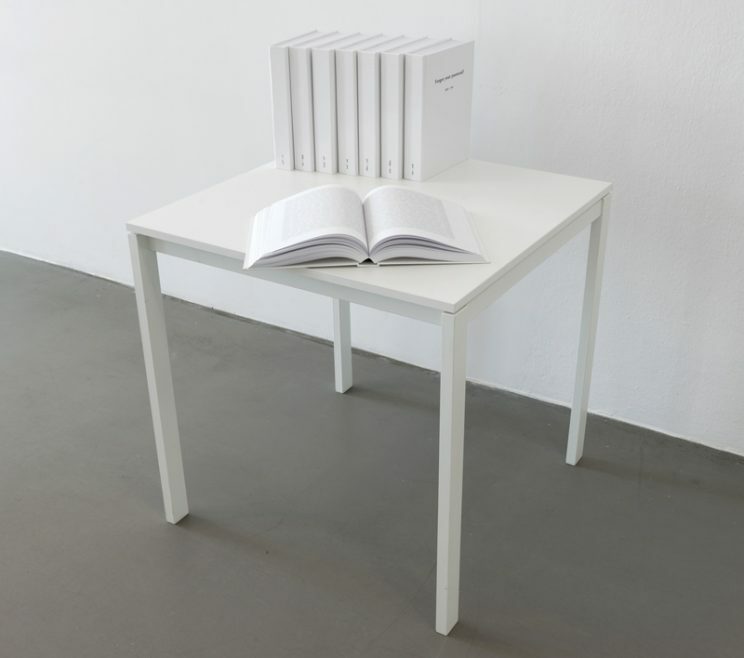 This reflection is not presented as a complex technological installation but as something as simple as a library, that has become a register of the subjects the artist is interested in, even though this register was not created by him but by an Amazon algorithm. These books are not necessarily ones that Martin John Callanan has read but ones which he would supposedly like to read. Between 2010 and 2011, Olia Lialina explored the public profiles of Hyves users. Created in 2004 and active until 2013, this social network was very popular in Holland, particularly among young immigrants, and even competed with Facebook. The artist was particularly interested in the way this platform allowed its users to personalise their pages and how codes were established as to how to present themselves to the world through the images they chose for their profile picture and wallpaper. Using these elements, she created a series of compositions that contrast the wallpaper image and the profile picture, selecting ones where the person cannot be recognised. Presented as a series of digital prints, Hyves Body Class Pimp reveals a creative use of the contents published by these young users and tries to create a portrait of them. In these compositions, the observer can see themselves reflected and consider how they project their own image on the internet and how the elements they use to do so can be gathered and manipulated. In 1974, author Georges Perec, a patient observer of daily life, decided to describe everything that occurred in a square in Paris over a period of three days. The resulting text, An Attempt at Exhausting a Place in Paris (1974), inspired Kyle McDonald to create this piece, which includes a recording of a public space and software that allows the people found there to be labelled and comments about them to be published. 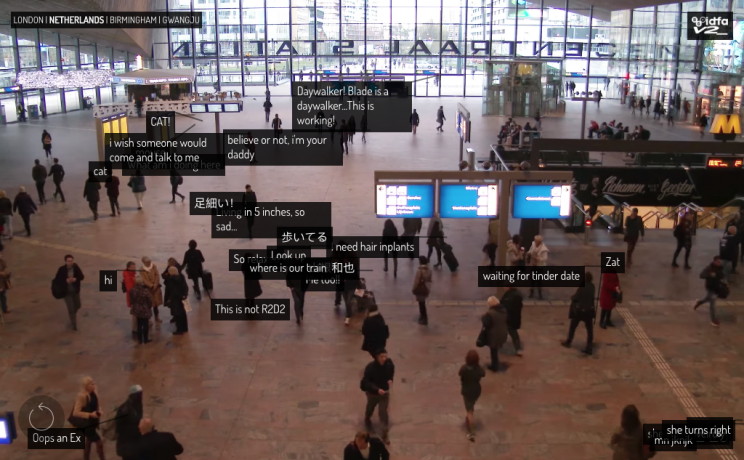 The work is stored on a website, allowing users to try out this method of surveillance and create short narratives and dialogues about an everyday scene. Nowadays Perec’s literary experiment would be perceived as an act of surveillance and could even be considered suspicious by the authorities who, monitoring the square, detect the presence of an individual observing the place and systematically taking notes. 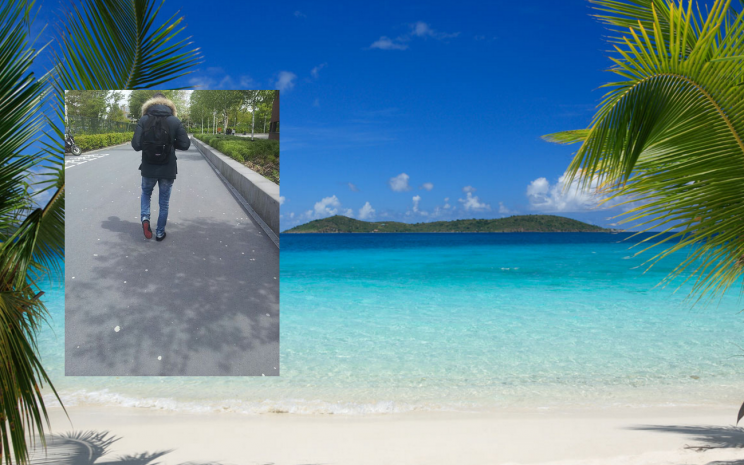 An attempt at exhausting a place can now be carried out automatically thanks to computer vision and artificial intelligence, whilst the possibility of labelling other people reminds us that we are always exposed to the eye and comments of other people, even those who observe us without being seen. 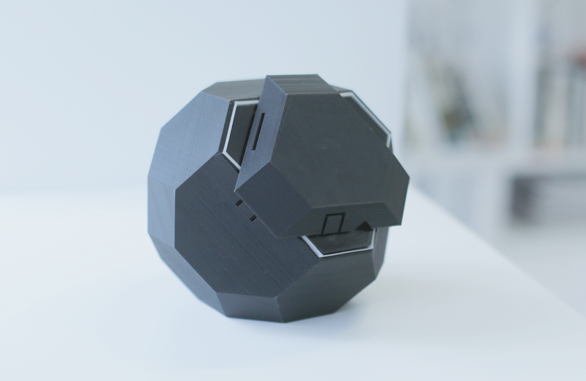 THERO is a device in the form of a sculpture, a router, open-source software and a freely-replicable 3D printed object. Inside a casing in the form of a truncated cuboctahedron is a Raspberri Pi 3 processor that manages the internet connection of any device connected to one of its ports or accessing a wireless network created by the sculpture. On the front, a mobile part allows the user to decide, at any time, the type of connection to the internet they want: secure (encrypted), without access to social networks or completely disconnected from any internet access. Using this device, the artists suggest a reflection on the conditions of privacy of our internet access and promote solutions that users could freely use thanks to the development of open-source software and an object that can be made using a 3D printer. At the same time, the intriguing presence of this sculpture, which the artists describe as a talisman, leads us to think about how we trust technology and glorify its products almost to the level of cult objects. Carlo Zanni finds inspiration in an accessory that allows the web cam or any computer to be covered, creating a sculpture that leads us to reflect on user privacy and the way that computers store a tiny piece of our lives. Hunping (soul jar) is a ceramic urn found in the tombs of the Han dynasty. The urn is placed in the tomb, next to the deceased’s belongings to hold their soul, which would enter it through one of the openings, and supposedly contained fruit. Zanni’s sculpture evokes this urn with its complex shape and fragile but heavy materiality, making it difficult to use. 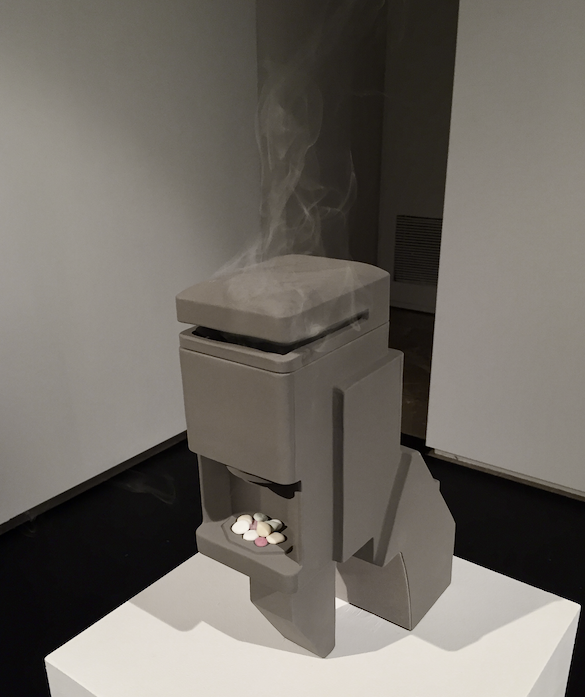 Like the Hunping urn, this piece becomes a ritual object, destined to preserve the user’s intimacy as if it were storing their soul.